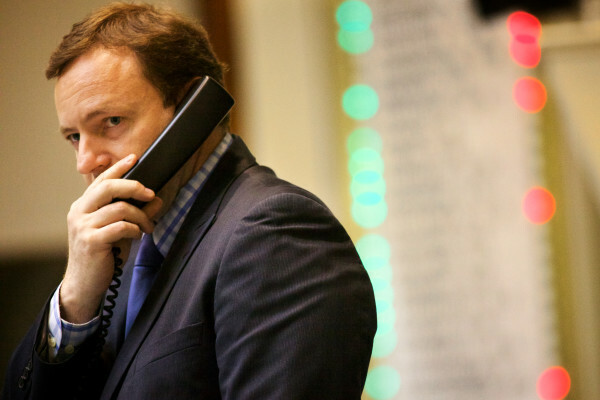 Speaker of the House Mark Eves, D-North Berwick, speaks on the phone as the House votes on a two-year budget. 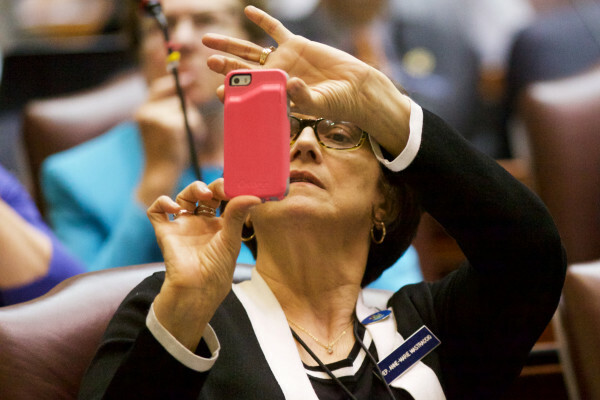 Anne-Marie Mastraccio, D-Sanford, takes a picture of the lighted vote tally board early Wednesday morning as the legislature passes a two-year budget. 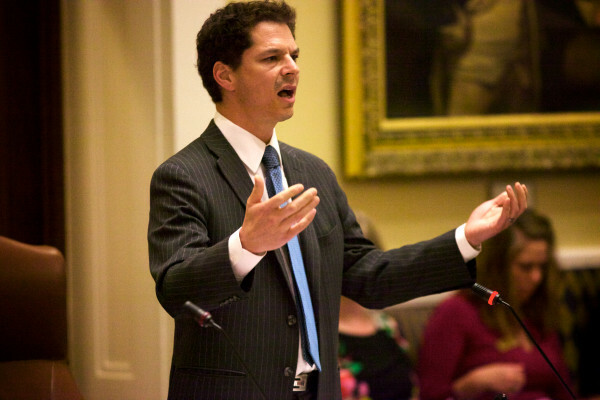 Senate Minority Leader Justin Alfond, D-Portland, argues for General Assistance for asylum-seekers and other legal non-residents Tuesday night in Augusta. 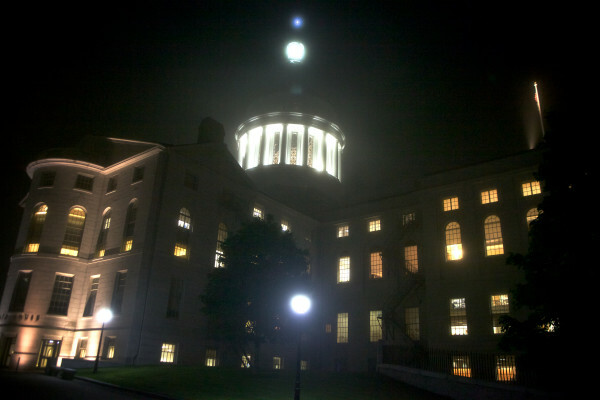 The State House shines through the the fog Tuesday night. 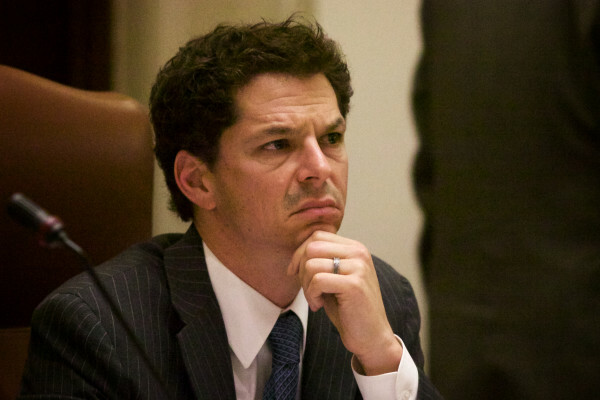 Senate Minority Leader Justin Alfond, D-Portland, watches as an amendment to extend General Assistance to asylum-seekers and other legal non-residents fails Tuesday night in Augusta. 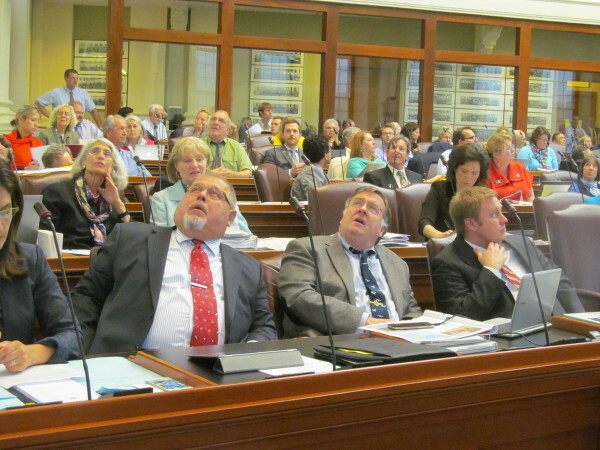 Democrats in the Maine House of Representatives watch votes tally on an amendment to the biennial state budget June 16, 2015 at the State House in Augusta. 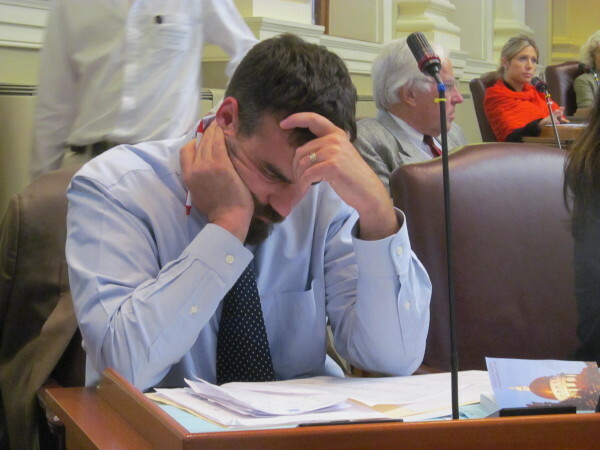 House Majority Leader Jeff McCabe, D-Skowhegan, frets about debate on the biennial state budget Tuesday, June 16, 2015, at the State House in Augusta. AUGUSTA, Maine — A $6.7 billion budget that included both tax reform and welfare changes was approved early Wednesday morning by the Legislature. The deal, finalized around 12:30 a.m., culminated months of sometimes acrimonious negotiations over the contentious two-year spending plan, which began in January when Gov. Paul LePage proposed sweeping changes to the state’s tax code and social safety net programs. The final deal approved by the Legislature is significantly less broad than LePage’s plan, but Republicans and Democrats both claimed victories. “We all know we’ve lived in the shadow of a shutdown now for weeks, but eventually we were able to get there. I think it’s a budget both parties can take pride in,” said Sen. Roger Katz, R-Augusta. The House voted 105-42 to give the bill final enactment, just over the two-thirds threshold needed to enact the bill as an emergency measure. The Senate’s final vote was 31-4. The bill now goes to the governor, who has 10 days, excluding Sundays, to act on it. LePage has said he will veto the bill, but with overwhelming support the budget earned in both chambers, lawmakers should have no trouble assembling the two-thirds votes needed to override a veto. Opposition to the budget came largely from two camps: Democrats upset that the bill did not address critical questions about access to General Assistance aid for legally present noncitizens — mostly asylum seekers — and Republicans upset the budget didn’t go further to reform welfare or cut spending. Most of the spending bill was established by a majority of the Appropriations Committee earlier this month. That plan — which passed the committee 9-4 — could have stood alone as the biennial budget, but was scuttled by House Republicans because it did not include welfare or tax reform. That left legislative leadership — House Speaker Mark Eves, D-North Berwick; Senate President Michael Thibodeau, R-Winterport; House Minority Leader Ken Fredette, R-Newport; and Senate Minority Leader Justin Alfond, D-Portland — to work through the sticking points that remained. The stakes were high, with lawmakers staring down a government shutdown if a deal wasn’t struck by the end of the month. The final piece of the deal, an amendment to the Appropriations budget, was agreed upon by the four party leaders late Monday. Lawmakers were briefed on the plan the same night, but details were tightly sealed from the public until just a few hours before the budget hit the House floor. The compromise bill includes an estimated $71 million overall tax reduction for Maine residents, while an additional $80 million is invested in K-12 education. It also includes increased property tax relief and additional funding for nursing homes and community medical services that continue to have long waiting lists. The accord is a culmination of turbulent tax negotiations that at some times seemed destined for failure. 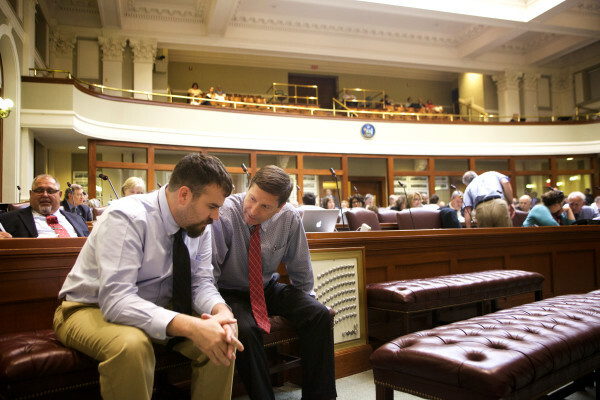 LePage, Democrats and Republicans each proposed plans, but none was able to win the support of a supermajority of lawmakers needed to pass a budget bill. Compromise was elusive. House Republicans threatened to torpedo an earlier deal struck by their Senate colleagues and the Democrats. That agreement included neither tax cuts nor welfare reform, both of which the House GOP demanded be a part of any agreement. All told, about 580,000 Maine families would see an overall tax decrease, according to a Maine Revenue Services analysis of the deal. About 117,000 Maine families would see an overall tax hike. Under the compromise budget amendment, Mainers at all earning levels would receive an income tax cut. Income up to $21,400 would be taxed at 5.8 percent, income between $21,400 and $50,000 would be taxed at 6.75 percent, and income above $50,000 would be taxed at 7.15 percent. The tax reform plan also includes changes in deductions and credits designed to target income tax relief to low- and middle-income residents, including a near doubling of the standard deduction, which would be pegged to inflation into the future. It also expands the Earned Income Tax Credit, which would be made completely refundable. Other deductions are phased out for higher earners. Income tax cuts were a demand of Republican budget negotiators while Democrats said any cuts must be tailored to benefit Maine’s middle class. According to a distributional analysis created by Maine Revenue Services, about 75 percent of the income tax cut would be distributed among the bottom 90 percent of Maine’s earners. The income tax cuts are paid for in part by increases in the sales tax. Under the deal, the sales tax would rise to 5.5 percent from a scheduled rate of 5 percent. The tax on restaurant meals and other prepared foods would rise to 8 percent from a scheduled 7 percent rate, and the tax on motels and hotels would rise to 9 percent from a rate of 7 percent. The deal also includes a new Sales Tax Fairness Credit for low-income Mainers to offset the regressive nature of sales tax increases. All single filers would receive a $125 credit, and all joint filers would receive a $250 credit. Thibodeau, who along with many Republicans campaigned against sales tax increases in 2010, said he could live with the deal despite their inclusion. In the compromise deal, military pensions would be exempted from income tax entirely, and an additional $3.5 million would be exempted from the state’s estate tax, bringing the tax on large inheritances in Maine in line with federal limits. The Homestead Property Tax Exemption would double, reaching $20,000 by 2017, and Maine’s K-12 schools would receive an additional $40 million in each year of the biennium. Those investments in property tax relief and education were must-have items for Democrats. Last, the compromise levels the so-called “welfare cliff” by ensuring TANF recipients would not immediately lose all benefits if they have an increase in salary or working hours. Instead, benefits would be phased out as the recipient’s income increases. One final point of dissent emerged late Tuesday — changes to the state’s policy regarding welfare benefits for legally present noncitizens. But the sticking point was smoothed over by lawmakers in an effort to ensure a budget deal passed. Democrats wanted to protect access to General Assistance for those immigrants from efforts by LePage’s administration to prevent “illegal aliens” from utilizing the program. The governor’s policy has caught legally present asylum seekers in its net by refusing to reimburse cities for General Assistance expended on those immigrants. The House passed a budget amendment to ensure those immigrants continued to be eligible, but the Senate rejected the amendment. Ultimately, the House voted 105-42 to recede, and accept the Senate’s plan.